Looks like we are getting to the ‘real things’ now. What a mouth-watering capture of this yummy-looking stack of pancakes! Looks nice – and for a one frame take looks even better! It’s look great and happy. I’ve arrived here after seeing from your muesli post, Martina, I can see that breakfast has now become more fattening! Never mind… With an image as enticing as this, who cares! Wonderful work! PS. I’ve followed your link to that gallery of food shots. What beautifully crafted images they are. The only problem now is that I want a slice of th cheesecake and a strong expresso! très jolie gourmandise ! mmmmmmmmmm!!! ONE TAKE? How wonderful – and it’s perfect. What a great quote, too. Something to remember when I crave that midnight snack! Wow, you have a way with food! Glad I saw your link on “Meandering Passage”. Great shot! 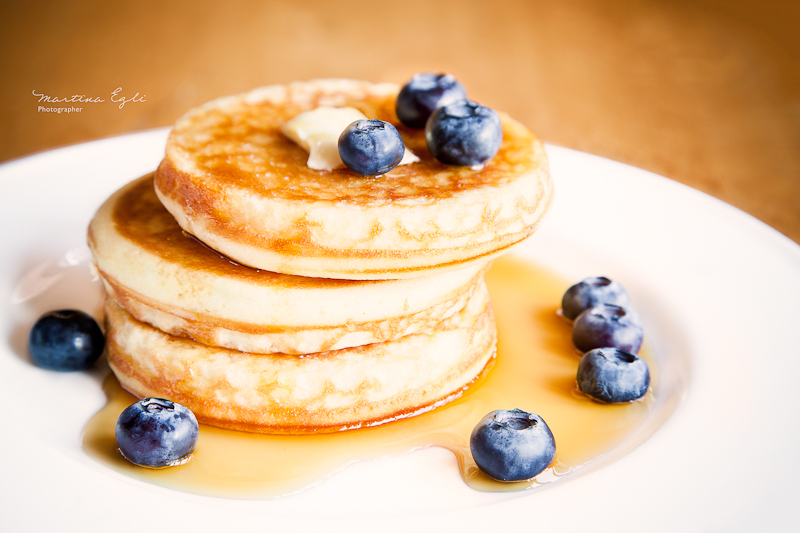 I looooove pancakes – great composition and light. My compliments. one word…YUM! Wonderful blueberry pancakes, makes me really want a stack! Fabulous food photography. The presentation and selective focus are just excellent! This cheers me up Martina!!! What a great photo you made here!! I’ve never seen blueberries and pancake look so good….yum!